Choose your favorite court surface and then choose Sport Systems. 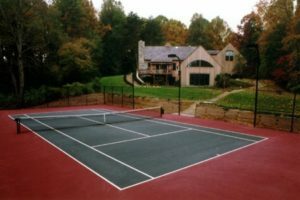 We’ll visit your site and prepare a free estimate for top quality court construction. Whether you prefer asphalt, cushioned asphalt, clay, or a synthetic court surface, Sport Systems is at your service. No single factor is more important to a well-built court than proper base construction. SSI has the experience, the equipment, and the personnel to ensure the sub-soils are properly prepared before any other work begins. Improper site drainage can ruin an otherwise well-built court. The adverse effects that water can have on a court base, stone and asphalt sections, and fence cannot be overstated. Poor site drainage is responsible for more court damage than any other factor. No paved surface requires more exacting tolerances than a tennis court. Slope, pitch, joint work, texture, compaction, and uniformity are critical on a tennis court. Our laser-guided grading equipment and experienced operators ensure that stone bases are perfect before being paved. Our in-house paving crews are the best in the business at this highly specialized work. Tennis play requires better light uniformity than almost any other sport. We’ve got the best systems in the industry. We utilize state of the art reflectors for unmatched light diffusion. Our specially designed fixtures and low profile mounting height keeps the light on the court with minimal light spillage. Our light poles are sturdy and electrostatically powder coated for years of performance. SPORT SYSTEMS was awarded first place in TENNIS INDUSTRY MAGAZINE’S “International Court of-the-Year Contest” for the court pictured above. A variety of fence styles and colors are available to compliment any tennis court environment. Proper fence installation is critical to any well-built court. Improper fence material and/or improper installation methods can ruin your court. Sport Systems uses the highest quality materials and installs fences with special equipment and in-house fence crews. Sport Systems is uniquely qualified to handle your project from early design stages through completion. We build walls, patios, steps, gazebos, and seating areas. There is no need to deal with multiple subcontractors. Sport Systems is a full service contractor. Tennis court coatings are used to protect the underlying asphalt surface from harmful oxidation and wear as well as to provide a smooth, uniform playing surface. We manufacture Sport Coat Brand 100% Acrylic Tennis Coatings. They are vibrant, long lasting coatings and can be adjusted to provide fast, medium or slow play speeds. Sport Coat is available in non-resilient and resilient form in a variety of colors.